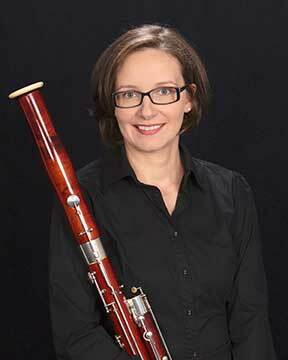 Marta Troicki has studied the bassoon both in the United States and Europe, earning a Music Education Degree from Hofstra University, and a Master of Music degree at the Purchase Conservatory of Music. During her years in New York, she enjoyed performing with New York Choral Society Orchestra, Queensborough Symphony Orchestra, The Westchester Symphony, Adelphi Symphony Orchestra, and Five: a Woodwind Quintet. She performed at the Carnegie Music Hall in New York City in chamber and orchestral settings. Following her move to Pittsburgh, she held a principal bassoon position with the Pittsburgh Live Chamber Orchestra. In 2007, Marta moved back to Warsaw, Poland and lived in her home country for 5 years. While there, she earned an Artist Diploma degree from the F. Chopin Conservatory of Music. She also performed with United Arab Emirates Philharmonic Orchestra in Dubai during that time. During the 2013-2014 season, Marta performed A. Vivaldi a minor Concerto with the Kenwood Symphony Orchestra and F. Mignone Concertino for bassoon and chamber orchestra with the Metropolitan Symphony Orchestra. Presently Marta is pursuing DMA in bassoon performance at the University of Minnesota School of Music and enjoys the opportunity to play with the Metropolitan Symphony Orchestra, North Star Winds, and the Sonora Ensemble of which she is a founding member. Marta lives in Edina with her husband and three young kids.